Round 2 option for Seattle? We could trade up to get Osweiler. I wish that was possible Bryan, but I’m led to believe there’s next to no chance Seattle drafts a QB in the first two rounds and the third is very unlikely too. Should have posted his game against Boise State. At least people could see his upside AND his downside but your blog. Glad the Hawks aren’t drafting a qb early because this guy would get Pete fired if he drafted him in the 2nd or higher. No pro day porformance can overcome some of the horrible mistakes this guy made throughout last season. Bad fundamentals come out with pressure in his face…anyone tell that I’m not a fan of the guy? Osweiler is some one that you draft to coach up and not to start right away. His physical attributes are one of a kind and may intrigue the FO but I would not draft him in the first two rounds unless they trade back and pick up more picks so that they still fill the need of a pash rusher and LB in first rounds. Maybe their is a Plan-C -? A trade down in the first round COULD provide two second round picks (plus a 5-th. maybe). The 1-st & one of the 2-nds of these three picks could then be used on DE/OLB & ILB/OLB. Leaving a 2-nd round pick if they WANT Osweiler. RB-Chris Polk seems to be going down in the ratings & he could be there at #75, although I’m of the opinion that pick needs to be used to upgrade WR with a touchdown maker, WR-Greg Childs (or Marvin Jones if he’s gone). Beyond that, a 4-th round option of RB-Cyrus Gray could be a consideration. The QB position is so important, and so difficult to field, that if Tannehill or Osweiler are graded as high-probability franchise QBs by PC/JS, they should draft them when they need to. Tannehill with 12, Brock in the second, if that’s what it takes. I didn’t like how Osweiler looked in the games I watched. His throwing motion was odd (the lowered elbow) and the offence he ran was unimpressive for a QB. Even so, I respect those that see potential in the guy, and his pro-day workout looked far better to me than Tannehills. Brock threw the ball with more authority, I thought, and he moved well for his size. Both guys are tremendously inexperienced, and it would take near-genius to project either of them as franchise NFL QBs, but if anyone can do that, PC/JS can. For those of you who don’t think a high draft pick (first or second) is worth spending on a guy who will sit a year or two, try waiting until you can draft number one overall for a guy like Luck, Stafford or Newton. Those chances don’t come by often, and Seattle unlikely to see a top pick anytime soon. Also, look a the best QB in the pros – Aaron Rodgers, and consider how Greenbay got him. First round despite having one of the greatest QBs in history on the team. The real question is whether PC/JS can pick the guy out. Tannehill? Osweiler? Wilson? Who, outside the top two, can eventually be the guy? And also, for those who feel JS/PC should be constrained by the Flynn signing, a beg to disagree. If they think they can upgrade the talent at the position, they should do so. Now. It seems like the national consensus is that Luck/RG3/Tannehill/Cousins/Osweiler have all had near flawless pro-days. Just makes you question everything you hear. To be fair, Cousins pro-day seemed to be more applauded because of his self-scripting of workout. I will take Russell Wilson in rounds 4-6 and be perfectly content with a battle with Portis for the teams developmental QB. What was that slip about Christian Ponder for the 12th pick??? Rob – Was the no QB in first 3 rounds from one of your sources? It just seems like we keep filling a lot of our team’s holes in the draft but never really take the risk to get the guy that we really want long term to be a QB. Maybe it is all an attempt to get enough draft capital to get their guy next year in Barkley. That Courtney Upshaw interview with Bucky Brooks shows his competitive attitude and willingness to do whatever is asked of him. I think the guy’s going to have a real impact on the league and hope that he is playing for our Seahawks! I’m psyched up for draft day!! I think the Ponder thing is saying that Rob rates him lower than Osweiler. If someone chose Ponder at 12 then it seems like a distinct possibility that someone would do it again and he thinks it should happen. Not that it will, but that it would make sense. Also, everyone needs to realize that Rob never said he does not think the Hawks should take Osweiler, just that it seems entirely unlikely in the early rounds of the draft. @Tom T. You read my mind. Cosell knows his stuff. Osweiler has excellent measureables, which is pretty much the only reason he’s generating this kind of attention. He ended the season on a five-game losing streak and declared for the draft after one good season that never even for a moment brushed up against ‘great.’ Like many have acknowledged, the guy has a ton of potential, but there’s so little information to base the pick on that Osweiler represents a significant gamble even by NFL Quarterback draft standards. Osweiler would be a late round, 5th-7th/UDFA grade on my board for the same reason I didn’t buy a MegaMillions ticket – but that’s just me. I’m all about Osweiler in the first, if Flacco and Freeman can come in with the level of “polish,” against thier college competition and compete why couldn’t he? Football is as much a business with the eye towards the future as it is anything else. At some point as a coach and GM you are going to have to make a big decision. With our current QB’s on two year deals it doesn’t say that they are sold as of yet on either one. The seahawks are a 7-9/9-7 team and that will put them year after year on track to not get one of two top qb’s each year. With Oz or any qb for that matter you can mold a guy now for success in your own system. I know I know DE/LB but there are several paths to take towards improving that problem and really this year there is no premiere pass rush de hat straight up screams Julius Peppers, there are a good deal of players though many are good to great all present problems from scheme, to work ethic, to one year phenoms….. The pick: Osweiler, high ceiling, and with Flynn, he doesn’t need to start right away and if Flynn is the man, so what, 1st round guys don’t always succeed, but if FLynn is mediocre as some of you believe we don’t go into the 2013 with everyone and their mom KNOWING we need a qb, we already have one. Thanks for the write-up, Rob. Always a pleasure to read. My question to you is (assuming you havent answered it already)……..
Would you prefer the Hawks draft Osweiler in 2nd (assuming he’s there) or draft one of the potential top QBs with their 1st in 2013? Im also curious as to your feelings on what Cosell had to say about Osweiler. I was all in with the idea the Hawks should seriously do what it takes to get Os until they signed Flynn. At this point i rather they see what they have in Flynn and use all the resources towards other positions of need…… And a trade down like Peter envisions would be great just not to get Os. I hope that Bruce Irvin becomes a Hawk at some point to be groomed as a LEO successor! Nice write up as always, Rob. But please no Oz (or any developmental QB) in the first 4 rounds. We have limited draft capital this year, a number of glaring holes, and if we want to give Flynn an honest chance, we need to surround him with as much talent as possible. The biggest skepticism surrounding Osweiler is his inexperience as a starter. He has started 15 games if I’m not mistaken, a very low number for a guy who flashed so much talent. This kid drops to the 3rd, I think you have to be on him. Everyone pleading for Russell Wilson or Kellen Moore or Austin Davis in the 4th is just praying a miracle happens with those players at the NFL level. Peter if that was the Hawks draft, I would be highly disappointed. The defense is a few players away from being an elite defense, and by not improving the pass rush in round one, they won’t be taking a step forward, which is what the Hawks need to do to be successful this season. A stout defense and the running game are going to be the back bone of the Hawks until they get a long term solution at QB. By drafting Brock Osweiler, the Hawks would be reaching for a QB, who has a very high chance of failing. After watching Arizona St. many times this season, Osweiler never really impressed, I would take Ryan Tannehill over Osweiler any day, I know Rob disagrees with that, but I’ve watched both enough to see more upside with Tannehill than I do Osweiler. I get very concerned when guy who were graded as 4th round prospects early in the draft process go through pro days, combines and workouts and then jump up to the first round. The Hawks need to focus on Pass rush, Linebackers and touched makers, stay away from the QB spot in the first 4 rounds. Flynn will be serviceable for now, but they key for any Hawks QB will be to get him so more weapons. who guarantees an improved pass rush in round one? I mean straight up Guarantees a pass rush in this draft with no concerns about produciton, competition, or work ethic?….no one, the point I was making is that team building is for the now, and for the future, in the scenario I lay out you do get passrushers, LB, QB, RB insurance and for the future, CB insurance and for the future, and depth…. I really think Flynn is our future. But if he isn’t, PC has already said that he will look for a QB in the 2013 draft. So why bother getting a backup? We already got Tavaris and Portis. We wouldn’t even be talking about Osweiller if he wasn’t 6’8″ tall – and that is a poor reason to pick a QB. Even in this draft there are a number of people like Cousins that will go in the third or fourth and are better QBs. And supposedly in 2013 there will be a bunch of great QBs coming out – though I predict it will shake out to a top 2 or 3 that we won’t be able to draft again. Really 2011 was our one chance to play Tavaris and tank the season and get a decent draft QB. Since we didn’t do that, we will never be able to draft an elite QB, and we my as well pick free agents who want their shot. Let someone else train them for three years, then we will take our pick. Yes it costs more, but they are seasoned and you have a better chance of evaluating their sucess. Peter- Osweiler should not be a first round pick watch the film. Further straight up guarantees a pass rush? What type of argument is that. So that means you spend it on a qb that has shown no ability to win or good decision making or accuracy but has some good measurable’s and potential. I am at a loss for word with this logic. People have become so crazy about the quarterback position that they don’t care how good of football players they are they will draft them in the first round based off of a pro day. I am still not sure how you guarantee the people you draft are going to bring a pass rush but nobody in the first round will. The reason the Seahawks should draft a QB this year is that the current players signed at the position are incredibly unimpressive. 3 – Flynn’s ceiling remains a mystery. He has demontrated NFL QB competence in his two starts, but he doesn’t fit the prototype that PC is looking for. So, plan on seeing another QB drafted this year. Likely one next as well. The Seahawks are thin thin thin at the most important position on the team. Flynn and Portis are largely question marks (TJax they/we know). Sure, Tannehill, Osweiler and Wilson are all question marks as well. That’s why they have to draft one of them and see if they can’t develop them into starting/franchise material. If by some chance they end up with two franchise guys, great: trade they guy they like the least and go from there. More likely, they will be balancing fair to good QB play and always looking to upgrade. Peter, Oz in round one would only happen if PCJS are high on glue fumes. There is no way that happens. Tannahil is WAY ahead of him, and they will have way too many chances at an elite player at 12. That would be a suicide pick, kinda like Tebow, cept way worse. All of this purely IMHO, of course. Jarhead, I don’t think your clever “Can’t Wynn” is catching on bro…. I personally highly disagree with your assessment on our QB situation. I happen to think Flynn will be great, TJax is a super solid #2, and Portis is the wildcard waiting to be unleashed. I highly doubt we draft a QB this year. In my opinion Flynn has recieved the schooling and pro- level experience (in-training mode) that will enable him to hit the ground running after spending the last 3 years in QB camp in Green Bay. No rookie will be bringing that to bear this year. And, he has already shown twice under real game situations the ability to play at a very high level. A return of Rice, BMW (who I doubt makes the team this year), Durham, along with Baldwin and Tate will provide grerat targets. A healthy TJax has already proven capable, in fact, at least one poster in here thinks TJax is the clear-cut superior product already, so we already have a potent 1=2 punch at QB, with an explosive cannon armed Portis currently enrolled at Seahawk QB camp. A strong crop of defense players available this year will further along our already serious defense. A new back-up beastmode, and a little O-Line depth should round out this years draft. Then we will get to see the magic happen as PCJS grab a few UDFA’s that slip through the cracks. The poor 49’ers will never recover from the beating they receive from us. Tom T – I disagree strongly with Cosell. One of the things he mentioned was a lack of toughness in the pocket, which I just don’t get. The guy consistently shows he’s willing to stand tall in the pocket and take hits. Maybe I’m wrong, but I got the impression he was weighing heavily towards the Boise State tape. Having seen it, and several other games, I think the mean of his overall display is worthy of a much more positive review. As for the arm, he fires into some very tight windows, he made a lot of x-factor plays that are tough. He’s not Ryan Mallett, but his arm is hardly a negative is it? Cannot agree with Cosell here. Pacificsands – I can’t speak for anyone else, but my impression of Osweiler is not just based on measurables. I genuinly believe he’s shown a lot of improvisation (a key aspect for me), even in defeats, he’s been the shining light for ASU. I think his accuracy is fine. Vin – I’d happily do both. Whatever it takes. I think you have to live for now any my idea would differ with what the team will do here. But we’ll see how it plays out. I think there needs to be an investment at some stage, sooner rather than later. I like guys available in 2013, but then I like Osweiler. Alaska – the Seahawks certainly are not planning on Flynn being the future. They’ve banked on him competing only, nothing more nothing less. The investment in Flynn is basically saying… here’s your shot. If you take it, fine. If not, we move on. Low risk. He will have to stand out, if he even beats out Tarvaris Jackson. The guaranteed pass rush is a ridiculous declarative, the point being as per my mock is that you can’t guarantee a thing in football. You need a pass rush, so you have to draft one? You need one bady ergo you mudraft one in the first or otherwise what, the pick is wasted? That’s not at all how I see the draft. It’s called “circular logic.” When you make a statement that validates an already held belief you conscribe to…. I like many people here do believe that we need a DE, perhaps more, and most people seem tobelieve that it HAS to be the first round or we’ve screwed the draft (for some people, it’ll be “yet again.”) I’m trying to show an alternate path to covering our needs, as well as to plan to the future. Dough, maybe Tannehill is a light year beyond Oz…..then we probably won’t be able to draft Tannehill *tada,* it doesn”t matter who is better the Oz, what matters is that we can draft him, and/or make it work or fail. What a great conversation…it just shows the passion we as Hawks fans have for our team. We each have our own views on how the Hawks will draft, and what it will take for us to succeed. I am part of the ‘pass rush’ bandwagon that hopes we draft Upshaw @ #12. Sure, he’s Rob choice….but I dont want Upshaw because Rob chose him…I want him because of what I saw on tape. And for the record, I dont believe that Upshaw will be our Ware, or Peppers, or Suggs, etc. But I do believe Upshaw can, and will IMPROVE our pass rush. Thats not to say that as a rookie he will put up 10 sacks, but I believe that he will bring another dimension to our defense that opposing Os will have to account for. That in itself, I believe, will make our defense instantly better…not elite, but better. And at #12, I dont think you should be expecting an elite player, but someone better than what you already have. Now as far as Osweiler goes. I will agree to disagree. Rob, and others, may be fans, but I am not. At least not in the first 3 rnds. I prefer Upshaw to Os in Rnd 1 & Kendricks to Os in 2. I think the Flynn signing bought us enough time to not get a qb before rnd 4. Im willing to see how far the Flynn signing take us. I think he can succeed in the Seahawks system, and I dont expect him to be putting up monster numbers. I am thrilled by the Flynn signing. I think he will do well, just not great. With a good team around him (what Seattle has built/is building) he will be successful. What I don’t see is a transcending talent. Sure, you can win SBs without such a QB, it’s just much harder. Build a good team and then add a top QB and that’s what takes the team over the top. Flynn can have the success Hasselbeck had – we can all respect that – but we’d like to see more at the position. Bigger arm, more athleticism, without giving up the mental skill-set Flynn brings to the table. Flynn is not going to scare anyone, and likely never will. The Seahawks can do better at the position, and signing Flynn gives them more time and more opportunities to do so. How is it that you already know Flynns ceiling? Was Joe Montana big with a rocket arm? Was he a super athlete? Was Fran Tark? and so on? I just find it interesting that a few of you have already decided on just how successful “Can’t Wynn” (just for you Jar) is going to be. With so many variables that create a teams success, like the “D”, the oLine, the RB, the Scheme, the Coach, the owner, the fans, the stadium, the emotion…. So many things need to align for a team to be successful, and for a QB to succeed within that team…, But some of you have this clarvoyant sense that can already tell us just how well Flynn is going to play… WOW! I wish I could do that. Personally, I have no idea how well he will do, but I think he’ll be really good. Does a QB have to be 6′-5″ to ever be able to be good enough? Derek Anderson sure was great wasn’t he? I just think it’s about how much fight is in the dog, not how big the dog is… At the QB spot anyways. Doug Flutie was ok wasn’t he? But at the end of the day, I guess your opinion about him carries exactly the same weight as mine does, ZERO, because neither of us really know. H77- I agree with all of that. I;m a fan of Osweiler’s tools, but something about listening to him speak is really off-putting. He kind of seems like one of those guys that is unaware of what’s going on around him, the temperament of the person he is talking to, whether people are buying what he’s selling, etc. Maybe he’s just immature. I don’t like his personality. It’s simply a discussion. Nobody is claiming to ‘know’ anything. We are sharing our views, and the funny thing is, ours arn’t so different. Is Flynn the next Brady? I don’t think so. I think he might be the next Hasselbeck – again, not a bad thing, just not the best thing. That’s just a fan’s opinion – nothing more. Funny you mention Flutie – he was fun to watch and reasonably successful, especially for his height. A name we normally hear when discussing the possible success of Russell Wilson. Trust me – I am not doing anything but making an argument, and making no effort to appeal to anyone’s authority, especially mine, because I don’t represent myself as having any. I agree with Doug once again…. Ask Detroit if Flynn scared them, and who now holds GB TD record for one game over the likes of Starr, Favre, and Rodgers. And I’ll take a young Matt Hass. any day of the week. After all, he helped us get to the only SB in Seahawks history. I think Flynn will be better then Matt anyway. Matt couldn’t throw a deep ball whatsoever, unless the WR was 5 yards out of bounds. But Flynn’s ceiling and floor are unknown still. It’s a great risk to take, especially when no picks were given up. I’m just happy T-Junk won’t be starting anymore. I’m all in favor of getting another QB still – But, not Osweiler. Garbage. We can now afford to wait and pick one 3rd round or later. And there’s nobody worth picking any earlier anyway. The other thing that I don’t think is disputable is PC’s intention of maximizing the competition at each position, and thereby, by extension, the talent level at each position. He even said he’d obtain someone to start over Thomas, if he could. While I personally believe (in opposition to several Seahawk fans) that the WR position is stacked with current and developing talent, I would assert that the QB position is not, and therefore, worthy of adding both FA and drafted talent to the position (as opposed to using the top two picks on a WR – I like the idea of drafting Greg Childs in the 3rd, the soonest I see a WR taken, and likely not even then). But hey, just my opinion. And finally, I don’t really care who agrees with who. If you can contribute to the discussion by presenting facts, observations, or perspectives we haven’t considered, great. And remember, this particular discussion isn’t about how good Flynn might or might not be: it’s about whether someone like Tannehill, Osweiler, or someone else (I happen to favor Wilson) should be/will be drafted by Seattle. As we can probably agree, we don’t know how successful Flynn will be in Seattle. Neither does PC or JS. We know they weren’t all that thrilled by him prior to meeting him in Seattle, where he impressed them with an impromptu workout and football interview. So from PC/JS perspective, they need more eggs in the basket in case one of them doesn’t hatch (or gets broken on the field). That is why I think Seattle should, and will, draft a QB this year. If Flynn rips it up, great. Ifr not, or if he gets hurt, you have someone else on your roster who might develop into a suitable starter. I have to say that I’d rather have had Ryan Mallett than Osweiler and the FO seemed uninterested in Mallett. Mallett is a superior thrower with similar height, which is actually more of a negative than a positive, but whatever. For some reason I don’t think Osweiler is the mobile, throw-on-the-move type QB we’d typically want to groom. I like him, but probably closer to round 3 or 4 given what we have and the other areas we can fill, solidify, or upgrade. Two key things determine the teams apparent interest in Osweiler and lack of it in Mallett. For starters, Seattle – and many other teams – didn’t even have Mallett on their board due to non-football reasons. Mobility was also seen as a big issue. Osweiler doesn’t have the same mobility issues, but he also doesn’t have the same character problems. Doug, straight up honestly- it’s very clear you’re a total flynn honk. I am not. Cant Wynn is just something I do for myself because I personally do not like him nor want him wearing Seahawk Blue. I don’t want it to ‘catch on’ and could really care less. You have previously annointed him as a pro bowler and that’s your perogative. I do not see it that way. And you can’t deny that I have said several times before that we will see just how everything plays out on the field. And please, anyone who watches that game against detroit and doesn’t see it as anything but a GB dog and pont show to get flynn a contract is just being silly. Half of his throws are off balance ‘spear chucker’ type hail mary long bombs where Jordy Nelson just embarrasses the DB trying to cover him. I beleive that we will see first hand that Fylnn does not possess nfl level talent. Hence he was a back up who Miami would not pony up 9 million a year for. Some love him, I do not. Cant Wynn is just for me. My take on this topic is that I feel there are several QB’s who could add more latent talent to the position than we already have. I have liked Osweiler for a while, some do not. I will not proclaim that he is can’t miss, but I just see something special happening when he gets his chance. So not one other person on Earth needs to agree with my take on anything Seahawks, I hope they don’t. I see this franchise, while they possess a certain degree of direction, lacking the on the field leadership that championship teams possess. Who is the offensive boss? Ask yourself that? The D has Earl Thomas, but who runs the O? Lynch? Rice? Russell Okung? I think we lack that player. So I’m hoping for more toughness from Upshaw, more thunder from Kendricks, and I hope the icy steel leadership from Matt Barkley in ’13. I don’t make my opinions a secret, but no one needs to agree with me. So I’m going to keep doing what I’m doing, and everyone else do the same. We will never all agree, but we all love the hawks in our different ways. This is a team of stinking bums, but they are OUR stinking bums. That’s the Seahawk way, and it’s awesome, by god! As I recall, Mallett’s game was far more refined and he had more experience, but he was highly immoble and his character concerns were considerable. I was hoping Seattle would draft Mallett, but after seeing the guy passed on twice by every team, I kind of got the message. What I can’t see in Osweiler’s game a projected franchise QB. Not saying he can’t be – I just can’t see it. I re-watched some of his tape today, and while some of his throws were very impressive, he didn’t appear consistent to me, or in control of his game. PC recruited high school athletes, and has seen many college QBs transition into the NFL – some with success, others not so much, so if anyone can project future NFL QBs, it has got to be him, and if he sees a future franchise NFL QB in Tannehill or Osweiler, I think he needs to reconsider his draft strategy (if the Flynn signing took them off a QB in the first two rounds) and pull the trigger to obtain one of these guys. Having said all that, I watched more Russell Wilson today, and if someone put a gun to my head and forced me to draft a QB for the Seahawks, I would take Wilson over anyone else other than the top two. And that would be straight up, that is, if it cost exactly the same draft capital. I think Wilson is the better college QB, and likely the better NFL QB, than Tannehill or Osweiler. Why? Aside from the physical tools (arm strength, foot speed, accuracy, etc.) I think Wilson plays the position better. He is smooth, confident, effective, running an offense almost identical to what Seattle wants to run. But again, for all those who think I am practicing some form of clairavoyance, just comparing game tape, experience, and the comments I have read by those with something to say about the guy. I do think Flynn fits Petes prototype, otherwise, why square peg round hole? My understanding is that Pete wants a system where you don’t necessarily leave everything in the Qbs hands. I believe Bill Walsh preached that a coach should make the Qbs job as easy as possible. That’s why we’re a run-oriented team ATM. Also, Pete’s content to buck the trend of the high-powered O. Sure, we’d all want a Brady, Manning, Rodgers, etc., but Pete seems content, maybe even determined, to do it another way……Defense & ball control. If you could put Tavaris & Flynn together, you probably get the ideal PC Qb. So I don’t think Flynn has to be great in order for the Hawks to succeed. Im not expecting the GB Flynn, because we’re not built that way. I expect sound decision making, ball control and ball movement, things that I think play towards Flynns strengths. Yeah, Mallett definitely had character red-flags, no doubt about that. Although that risk is hard to judge, the cost of where he went in that draft may end up being worth it. The physical tools were really off-the-charts in terms of being able to sling the rock. He did have limited mobility, but I wonder if it’s something he can overcome with his arm. It’s good enough to consider that becoming true. I don’t have the same feeling about Osweiler, though certainly a more safe prospect for the reasons we’ve mentioned. For all those argueing against Flynn – you are directly contradicting PC plan. The deal is done. PC wants him to suceed, he wants the team to suceed. There will not be a high round draft of a QB because he already has a great QB and two backups. Perhaps a 6 or 7, but I bet it will be another UFA if anyone. Besides he seems more interested in picking QBs that have already spent a little time in the NFL, perhaps he believes they are better qualified than most draft picks. After all, only Luck and Griffin have a real chance of making it. Tannehill is a maybe. The rest have less than 10% chance, even Osweiller. The thing I find humerous is how people who want Osweiller and Upshaw justify their decisions for the exact opposite reasons. Upshaw is a tough gamer from a winning national championship team, but his measureables are slow, and he doesn’t show good lateral movement. His pick is based on his high motor, toughness, heart, and that he is a winner! Osweiller is chosen not because he is sucessful or a winner, it’s based on his measurables. He is tall and can throw a long ball. He is raw and has never learned the things it takes to be a winning QB, like reading a defense and playing at pro speed. But we want him because he measures well. So there you have it, we justify our choices subjectively based on who ever we want – and sometimes that requires us to believe the exact opposite qualities of two players. I almost feel that there is a certian type of mobility that we he is looking for that we haven’t been able to decipher as of yet with the QB’s that we have had…. I wanted to say thanks for taking a moment to state who you like draft positionally and why…Sometimes, actually all the time, it’s great to see people make a firm, cogent, case for what they like, instead of immediately being…”hell no man, dude’s a joke!! !” and then not follow it up with anything else….. 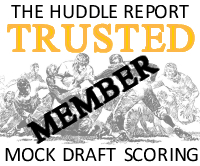 I went back and reviewed your ‘goofy mock.’ While I dont necessarily agree with some of the picks, I can definitely appreciate that you took the time to think it through. Like you said, a different path to achieve stated results. And in the end, we’re all after the same thing, arent we? Tecmo Bowl on Kansas City Chiefs to trade for Frank Clark? Sea Mode on Kansas City Chiefs to trade for Frank Clark?